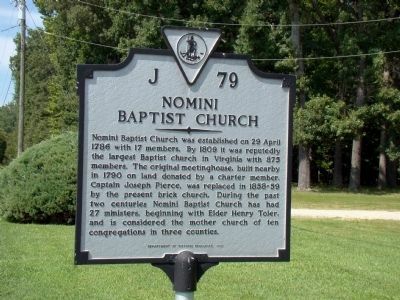 Nomini Baptist Church was established on 29 April 1786 with 17 members. By 1809 it was reputedly the largest Baptist church in Virginia with 875 members. The original meetinghouse, built nearby in 1790 on land donated by a charter member, Captain Joseph Pierce, was replaced in 1858–59 by the present brick church. 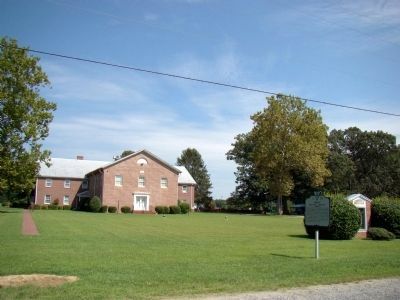 During the past two centuries Nomini Baptist Church has had 27 ministers, beginning with Elder Henry Toler, and is considered the mother church of ten congregations in three counties. Location. 38° 4.258′ N, 76° 46.511′ W. Marker is near Montross, Virginia, in Westmoreland County. 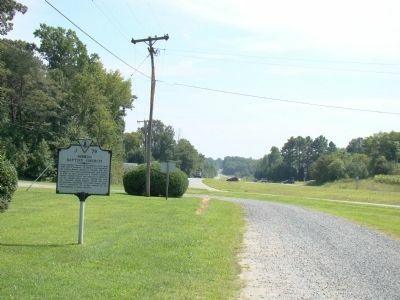 Marker is at the intersection of Kings Highway (Virginia Route 3) and Templemans Road, on the left when traveling east on Kings Highway. Touch for map. This marker is in the area of the county once called Templemans Crosssroads. Marker is in this post office area: Montross VA 22520, United States of America. Touch for directions. Nomini Baptist Meetinghouse (approx. 1.3 miles away); The War of 1812 / British Landing at Nomini Ferry (approx. 3.1 miles away); Nominy Church (approx. 3.1 miles away); Private Tate, Buffalo Soldier (approx. 3.2 miles away); Old Westmoreland Courthouse (approx. 3.3 miles away); Vietnam War Memorial (approx. 3.3 miles away); Westmoreland County Confederate Monument (approx. 3.3 miles away). Touch for a list and map of all markers in Montross. More. Search the internet for Nomini Baptist Church. Credits. This page was last revised on June 16, 2016. This page originally submitted on September 10, 2009, by J. J. Prats of Powell, Ohio. This page has been viewed 920 times since then and 10 times this year. Photos: 1, 2, 3. submitted on September 10, 2009, by J. J. Prats of Powell, Ohio.